Barry & Bernie Curry started Thrifty Car Rental in Spokane with one employee and 35 car rental vehicles in August of 1978. Their motto has always been "Take care of our customers or someone else will". They have worked hard to create a company culture that is has a "Hard work ethic" , has staff with a positive disposition and who is "Willing to go the extra mile" in customer service and has good value as well as quality. In the 35+ years they have been in business they have grown into five rental locations. (Spokane Int'l Airport 509-838-8223. Thrifty on North Wall 509-482-7716. Thrifty in the Spokane Valley 509-924-9111. Thrifty in Coeur d'Alene on 4th street 208-765-2277 and Thrifty in Sandpoint at 208-765-2277) Thrifty has gained a repeat local repeat customer base. 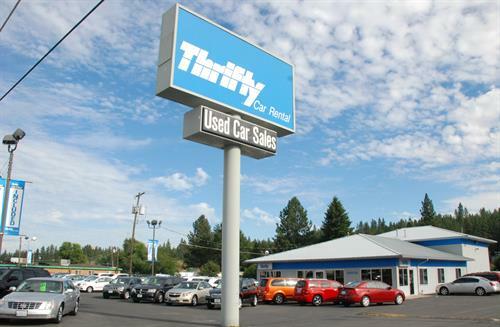 Thrifty also sells vehicles at three of their local locations on N. Wall, in the Valley on East Sprague as well as in Coeur d'Alene. At Thrifty the "Car Sales" department has a friendly, knowledgeable car sales staff. Our "Thrifty Car Salesman" are non-pushy and want to help you make the best choice of a vehicle at a reasonable price without hassles. Thrifty takes trade inns, has warranties and offers low interest financing options. 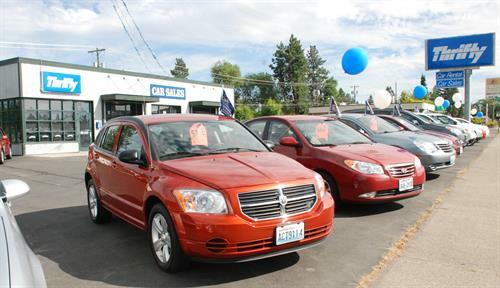 You can also check the vehicles Thrifty sells at ThriftySpokane.com or Thriftycda.com. We want to thank our loyal customers for their business and we will continue to strive and work our hardest to give you "outstanding customer service" as well as good value for our quality product. We have a wide selection of vehicles from economy, midsize, vans, trucks and SUV's.